Enjoy the delicious taste of juicy, home-grown strawberries or freshly picked herbs right on your doorstep. 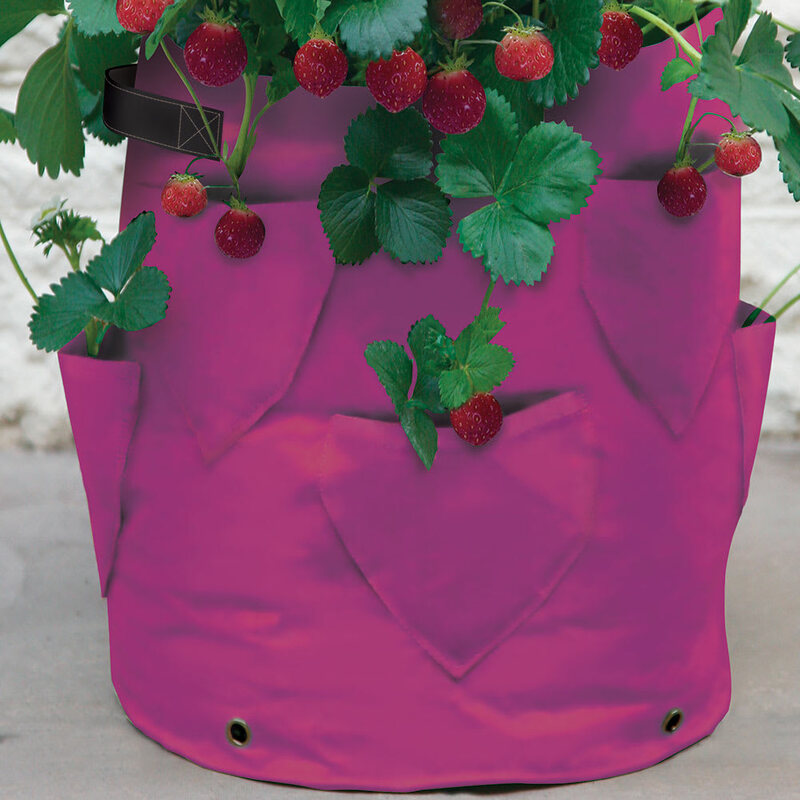 Designed for use on patios, balconies or in small gardens. Depth 25cm (10" ) Height 45cm (1ft 5"). 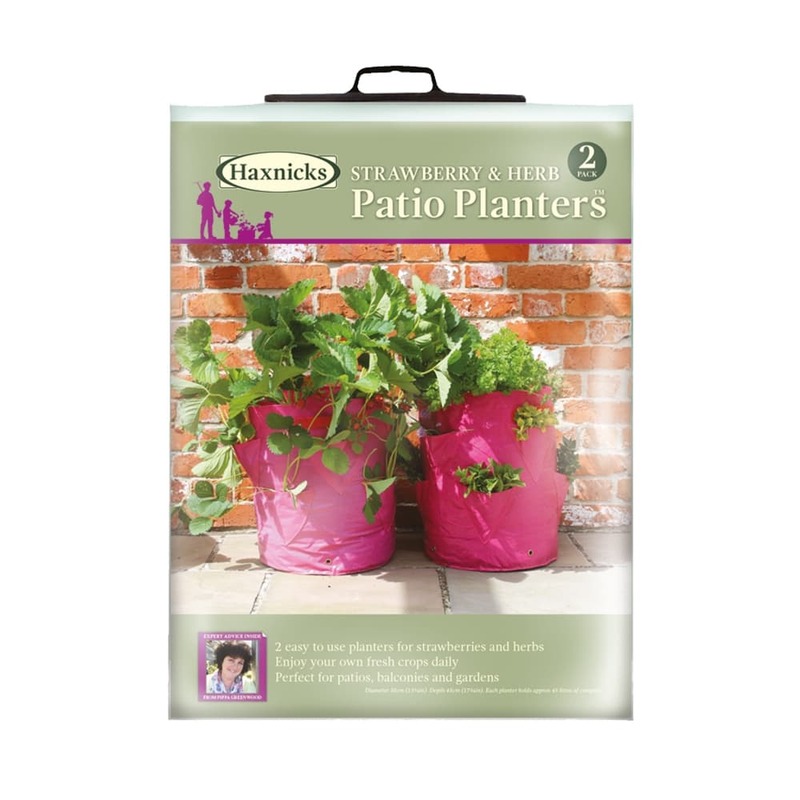 Haxnicks Strawberry & Herb Patio Planters have eight planting pockets around the side. 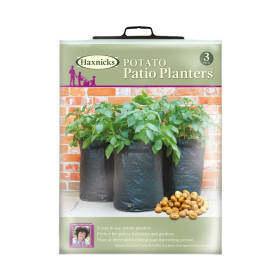 They are made of a tough polythene with reinforced drainage holes and handles on each side. They fold flat for easy storage and can be reused again, and again. 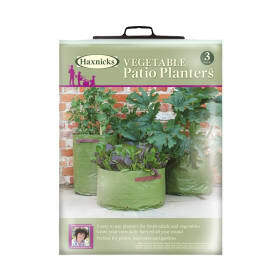 Each pack comes with a helpful growing guide with lots of advice and recipe suggestions too. Two planters in a pack. Helpful Haxnicks hint: Watch out for slugs, snails and children once the fruit appears! 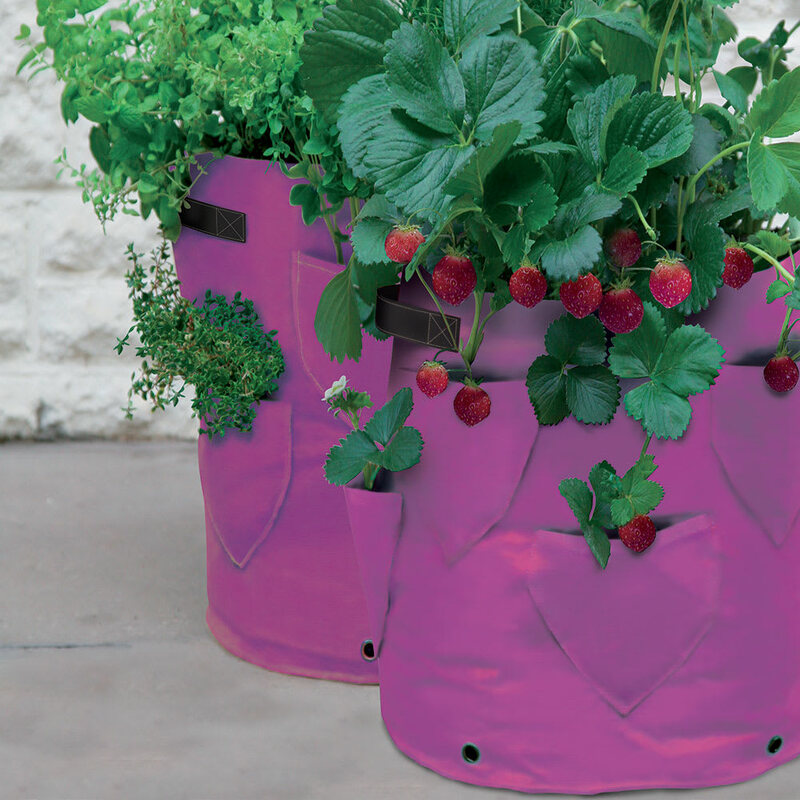 Enjoy the satisfaction of picking your own tasty herbs or strawberries straight from your Patio Planter™, knowing exactly how they have been grown. Most garden centres and mail order catalogues sell ready grown young plants, so choose the varieties you like, use our suggestions, or keep costs to a minimum and start your own tasty vegetables from seed in pots on the windowsill. Seed packets or plant labels usually indicate if a variety is particularly suitable for container growing. 1. Place a layer of gravel, broken pots or other suitable material into the bottom of the planter to help drainage. 2. 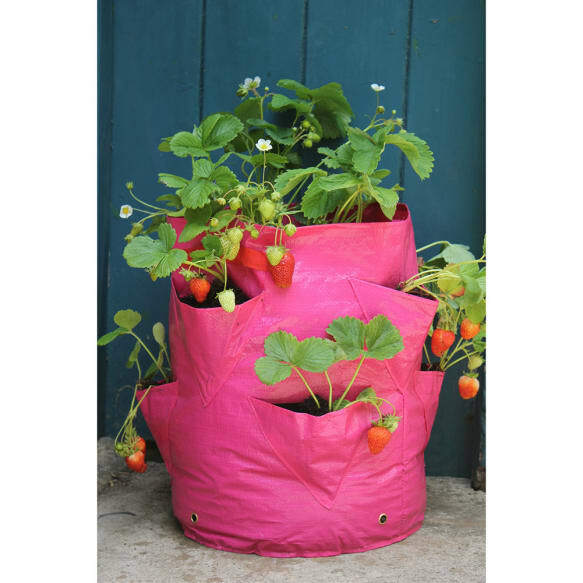 Fill with good quality multi-purpose compost to approximately 8cm (3in) height from the top of the planter, ensuring the compost nearly fills each of the side pockets. 3. Following instructions on plant labels or seed packets, remembering to thin out seedlings when large enough to handle. 4. Water plants before planting and allow to drain. 5. Carefully water in after planting without soaking the compost. 6. Do not place outdoors until after last frosts, or keep in the light, in a frost free situation. 7. Water regularly and do not allow the compost to dry out. 8. Feed regularly from early summer with a good liquid feed or use a slow release fertiliser following manufacture’s instructions. Most garden centres and mail order catalogues sell ready grown young strawberry plants, or keep costs to a minimum and grow your own tasty strawberries from seed indoors in pots on the windowsill. Most are particularly suitable for container growing and will add wonderful fragrance, interest, and colour to a sunny patio. Choose the varieties to suit the top of the planters (larger bushy herbs), and the pockets around the sides (smaller less frequently used herbs), using our simple guide to help you. BASIL - Makes a perfect patio herb. 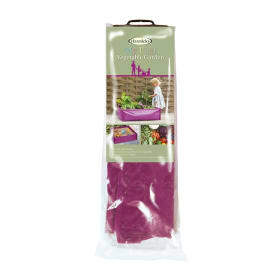 Literally dozens of different varieties with many existing scents, colours and flavours. FENNEL-Leaves are used with fish and in soups. Seeds can be used to flavour cooking and pickled. Also said to reduce the toxic effects of alcohol. FEVERFEW-An attractive daisy like flower will add colour to the patio. Leaves have been used since ancient times to treat migraines and arthritis.